The term hypoplastic left heart syndrome (HLHS), initially proposed by Noonan and Nadas,  describes a spectrum of cardiac abnormalities characterized by marked hypoplasia of the left ventricle and ascending aorta. This is the same disorder characterized as hypoplasia of the aortic tract complex by Lev. The aortic and mitral valves are atretic, hypoplastic, or stenotic. A patent foramen ovale or an atrial septal defect is usually present. The ventricular septum is usually intact. A large patent ductus arteriosus supplies blood to the systemic circulation. Systemic arterial desaturation may be present because of complete mixing of pulmonary and systemic venous blood in the right atrium. Coarctation of the aorta is also commonly present. See the images below. This echocardiographic still frame shows a long-axis view of the aortic arch in a patient with hypoplastic left heart syndrome (HLHS). The ascending aorta is markedly hypoplastic, serving only to deliver blood in a retrograde fashion to the coronary arteries. An echo-bright coarctation shelf is seen at the insertion of the ductus arteriosus. This echocardiographic still frame shows a 4-chamber view of the heart in a patient with hypoplastic left heart syndrome (HLHS). A large right ventricle (RV) and hypoplastic left ventricle (star) are seen. Right atrium = RA. Left atrium = LA. Hypoplastic left heart syndrome is a uniformly lethal cardiac abnormality if not surgically addressed. Since the description of surgical palliation by Norwood in the early 1980s [3, 4] and the description of allograft cardiac transplantation by Bailey in the mid 1980s,  the interest in this lesion has remarkably increased. Currently, the Norwood surgical approach consists of a series of 3 operations: the Norwood procedure (stage I), the hemi-Fontan or bidirectional Glenn procedure (stage II), and the Fontan procedure (stage III). Orthotopic heart transplantation provides an alternative therapy, with results similar to those of the staged surgical palliation. Currently, the survival rate of infants treated with these surgical approaches is similar to that of infants with other complex forms of congenital heart disease in which a 2-ventricle repair is not possible. Hypoplasia of the left heart structures is noted, with enlargement and hypertrophy of the right heart. Similar to other congenital heart defects, hypoplastic left heart syndrome also has a spectrum of severity. In the most severe form, aortic and mitral valve are atretic, with a diminutive ascending aorta and markedly hypoplastic left ventricle. The left atrium is usually smaller than normal, although it may be normal in size or enlarged. It receives all pulmonary veins. Pulmonary vein stenosis is a rare but important abnormality. The mitral valve may be atretic, hypoplastic or severely stenotic. The atretic mitral valve consists of fibromuscular tissue instead of a membrane. When the valve is stenotic, the entire mitral valve apparatus, including the valve annulus, valve leaflets, papillary muscles, and chordae tendineae, is small and hypoplastic. Coarctation of the aorta may be present in a significant number of patients with hypoplastic left heart syndrome, [3, 9, 10, 11] but interrupted aortic arch is rare. The right heart (ie, right atrium, right ventricle, pulmonary arteries) is markedly enlarged. A patent foramen ovale is common; herniation of the valve of the septum into the right atrium may be noted. Rarely, the patent foramen ovale is completely closed. A true atrial septal defect is rarely present. Ventricular septal defect is not considered to be an integral part of hypoplastic left heart syndrome, although it may be present in the syndrome of mitral atresia with normal aortic root. The most common presentation is visceroatrial situs solitus with D-ventricular loop and atrioventricular and ventriculoarterial concordance, as well as levocardia. Rarely, dextrocardia and heterotaxy may be present. Because of widely patent ductus arteriosus and high pulmonary vascular resistance in the fetus, a small portion of the blood from the right heart enters the lungs. Most of the blood is directed into the aorta via the ductus. Once in the aorta, the blood gets distributed into the brachiocephalic vessels, ascending aorta, and descending aorta. The quantitative distribution into these different vascular beds depends on their relative vascular resistances. The ascending aortic blood flows in a reverse direction and supplies the coronary arteries. Larger quantity of flow across the ductus with a higher PO2: Whether these factors influence the development of ductal musculature, which may, in turn, influence postnatal ductal closure, is unclear. Lower PO2 and questionably lower blood flow to the brain: The weight of the brain is generally normal, although no detailed studies on the cellular development of brain have been performed. However, whether the reported association between brain anomalies and hypoplastic left heart syndrome is related to abnormal flow and PO2 to the brain remains unknown. Higher PO2 to the lungs: The low PO2 in the pulmonary artery blood in the normal fetus is believed to be responsible for development of muscular pulmonary arterioles. Higher-than-normal PO2 in hypoplastic left heart syndrome may lead to lack of normal medial muscular hypertrophy, which may result in rapid decline of pulmonary vascular resistance after birth. Retrograde coronary blood flow via a long channel with lower PO2: This abnormality is not believed to interfere with supply of normal quantities of oxygen and nutrients to the myocardium. However, whether myocardial reserve is adversely affected is unclear. Blood flow is inversely proportional to resistance (Ohm law); that is, when resistance in blood vessels decreases, blood flow through these vessels increases. Following birth, pulmonary vascular resistance decreases, which allows a higher percentage of the fixed right ventricular output to go to the lungs instead of the body. Although increased pulmonary blood flow results in higher oxygen saturation, systemic blood flow is decreased. Perfusion becomes poor, and metabolic acidosis and oliguria may develop. Coronary artery and cerebral perfusion also depend on blood flow through the ductus arteriosus and then retrograde flow via the aortic arch and ascending aorta. Therefore, increased pulmonary blood flow results in decreased flow to the coronary arteries and brain, with a risk of myocardial or cerebral ischemia. Alternatively, if pulmonary vascular resistance is significantly higher than systemic vascular resistance, systemic blood flow is increased at the expense of pulmonary blood flow. This may result in hypoxemia. A delicate balance between pulmonary and systemic vascular resistances should be maintained to ensure adequate oxygenation and tissue perfusion. Most patients with hypoplastic left heart syndrome also have coarctation of the aorta. This can be significant enough to interfere with retrograde flow to the proximal aorta. Most likely, the primary abnormality occurs during aortic and mitral valve development. During cardiac development, adequate flow of blood through a structure is largely responsible for the growth of that structure. With little or no blood flow because of aortic and mitral valve atresia, growth of the left ventricle does not occur. Similarly, growth of the ascending aorta does not occur because of lack of left ventricular output. The ascending aorta is perfused in retrograde manner from the ductus arteriosus functioning only as a common coronary artery. Premature closure or absence of the foramen ovale represents another theoretical cause of hypoplastic left heart syndrome because it eliminates fetal blood flow from the inferior vena cava to the left atrium. Fetal pulmonary blood flow is not sufficient for normal development of the left atrium, left ventricle, and ascending aorta. Incidence of hypoplastic left heart syndrome is 0.16-0.36 per 1000 live births. It comprises 1.2-1.5% of all congenital heart defects. [22, 23] Hypoplastic left heart syndrome accounts for 7-9% of all congenital heart disease diagnosed in the first year of life. Before surgical treatment was available, hypoplastic left heart syndrome was responsible for 25% of cardiac deaths in the neonatal period. The rate of occurrence is increased in patients with Turner syndrome, Noonan syndrome, Smith-Lemli-Opitz syndrome, or Holt-Oram syndrome. Certain chromosomal duplications, translocations, and deletions are also associated with hypoplastic left heart syndrome. The international frequency is similar to that in the United States. Hypoplastic left heart syndrome is more common in males than in females, with a 55-70% male predominance. Hypoplastic left heart syndrome typically presents within the first 24-48 hours of life. Presentation occurs as soon as the ductus arteriosus constricts, thereby decreasing systemic blood flow, producing shock, and, without intervention, causing death. 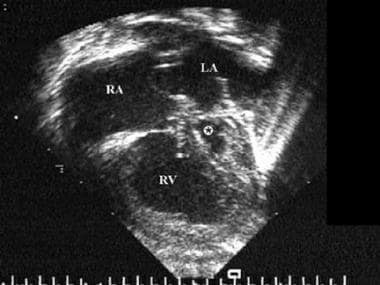 Infants with pulmonary venous obstruction (absent or restrictive patent foramen ovale) may present sooner. Very rarely, an infant with persistence of high pulmonary vascular resistance and the ductus arteriosus may present later because of balanced pulmonary and systemic blood flow. Overall survival to the time of hospital discharge after the Norwood procedure is nearly 75%. Success rates are higher in uncomplicated cases and lower in cases in which important preoperative risk factors are present, such as age greater than 1 month, significant preoperative tricuspid insufficiency, pulmonary venous hypertension, associated major chromosomal or noncardiac abnormalities, and prematurity. Survival after the bidirectional Glenn/hemi-Fontan and Fontan operations is nearly 90-95%. The actuarial survival rate after staged reconstruction is 70% at 5 years. Neurodevelopmental prognosis is not known; however, abnormalities are reported. Approximately 20% of infants listed for cardiac transplantation die while waiting for a donor heart. After successful transplantation, the survival rate at 5 years is approximately 80%. When the preoperative mortality is considered, the overall survival rate after cardiac transplantation is approximately 70%, or similar to the results for staged reconstruction. Hypoplastic left heart syndrome has the greatest mortality rate among all coronary heart conditions. Without surgery, hypoplastic left heart syndrome is uniformly fatal,  usually within the first 2 weeks of life. Survival for a longer period occurs rarely and only with persistence of the ductus arteriosus and balanced systemic and pulmonary circulations. Following the Norwood procedure (stage I), overall success (survival to hospital discharge) is approximately 75%. Success rates are higher (85%) in patients with low preoperative risk and lower (45%) in patients with important risk factors. The risk factors for poor result are multiple and vary from study to study and include prematurity and major noncardiac malformations. Other identified risk factors include surgery in older infants (>1 mo), significant tricuspid regurgitation, and pulmonary venous hypertension. High Aristotle scores are also associated with poor prognosis. Some centers have reported stage I survival rates in excess of 90%. This appears to be related, in part, to institutional surgical volume. The overall success following the bidirectional Glenn or hemi-Fontan procedure (stage II) approaches 95%. Success after completing the Fontan procedure (stage III) approaches 90%. Orthotopic heart transplantation results in early and long-term success similar to that of staged reconstruction. Among low-risk patients who undergo staged reconstruction or transplantation, actuarial survival at 5 years is approximately 70%. Substantial morbidity is associated with multiple cardiac catheterizations, cardiac interventions, and cardiac surgery in patients undergoing Norwood palliation. Similarly the need for multiple cardiac biopsies and hospitalizations related to immunologic management and infections exist in patients who had cardiac transplantation. Most studies report neurodevelopmental disabilities in a significant number of patients who survive either staged surgical reconstruction or cardiac transplantation. Preoperative complications include acidosis, congestive heart failure (CHF), renal failure, liver failure, necrotizing enterocolitis, sepsis, and death. Postoperative complications include acidosis, CHF, renal failure, liver failure, necrotizing enterocolitis, sepsis, pericardial or pleural effusion, phrenic or recurrent laryngeal nerve damage, stroke, coarctation of the aorta, and death. Early graft rejection and opportunist infection may occur after cardiac transplantation. Major complications following the bidirectional Glenn/hemi-Fontan procedure include transient superior vena cava syndrome and persistent pleural or pericardial effusion. The development of systemic venous to pulmonary venous collateral vessels is possible. Major complications following the Fontan procedure include persistent pleural or pericardial effusion. Neurodevelopmental abnormalities are reported and may be inherent in some patients with hypoplastic left heart syndrome. Arrhythmias, obstructed venous pathways, and protein-losing enteropathy are some of the other complications observed following the Fontan operation. At the outset, appropriately warn the parents and other caregivers that hypoplastic left heart syndrome is a complex heart defect that requires multiple hospitalizations, surgeries, catheter interventions and long-term follow-up. Educate parents regarding the doses and side effects of their child's cardiac medications. Discuss interactions with other medications with the family and the infant's general pediatrician. Many infants require nasogastric or G-tube tube feeding after discharge from the hospital. Parents must become comfortable with placement of the nasogastric feeding tube and/or care for the G-tube, as the case may be. Frequently, increased-calorie formula is required for adequate growth. Provide the formula recipe or a source for purchasing it to the caregiver. Stress the importance of follow-up care. If necessary, provide cab or bus vouchers to ensure compliance. If noncompliance becomes a critical issue, physicians are required to report to the appropriate family services agency. Noonan JA, Nadas AS. The hypoplastic left heart syndrome. Pediat Clinics N Amer. 1958. 5:1029. Lev M, Arcilla R, Rimoldi HJ, Licata RH, Gasul BM. Premature narrowing or closure of the foramen ovale. Am Heart J. 1963 May. 65:638-47. [Medline]. Norwood WI, Kirklin JK, Sanders SP. Hypoplastic left heart syndrome: experience with palliative surgery. Am J Cardiol. 1980 Jan. 45(1):87-91. [Medline]. Norwood WI, Lang P, Hansen DD. Physiologic repair of aortic atresia-hypoplastic left heart syndrome. N Engl J Med. 1983 Jan 6. 308(1):23-6. [Medline]. Bailey L, Concepcion W, Shattuck H, Huang L. Method of heart transplantation for treatment of hypoplastic left heart syndrome. J Thorac Cardiovasc Surg. 1986 Jul. 92(1):1-5. [Medline]. Rao PS, Striepe V, Merrill WH. Hypoplastic left heart syndrome. Kambam J (ed.). Cardiac Anesthesia for Infants and Children. St. Louis, MO: Mosby-Year Book; 1994. 296-309. Freedom RM, Williams WG, Dische MR, Rowe RD. Anatomical variants in aortic atresia. Potential candidates for ventriculoaortic reconstitution. Br Heart J. 1976 Aug. 38(8):821-6. [Medline]. [Full Text]. Balfour IC, Covitz W, Davis H, Rao PS, Strong WB, Alpert BS. Cardiac size and function in children with sickle cell anemia. Am Heart J. 1984 Aug. 108(2):345-50. [Medline]. Bharati S, Lev M. The surgical anatomy of hypoplasia of aortic tract complex. J Thorac Cardiovasc Surg. 1984 Jul. 88(1):97-101. [Medline]. Von Rueden TJ, Knight L, Moller JH, Ewards JE. 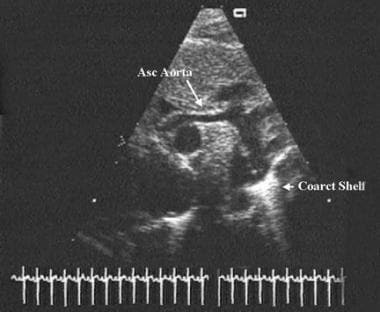 Coarctation of the aorta associated with aortic valvular atresia. Circulation. Nov 1975. 52(5):951-4. Jonas RA, Lang P, Hansen D, Hickey P, Castaneda AR. First-stage palliation of hypoplastic left heart syndrome. The importance of coarctation and shunt size. J Thorac Cardiovasc Surg. 1986 Jul. 92(1):6-13. [Medline]. Norwood WI Jr. Hypoplastic left heart syndrome. Ann Thorac Surg. 1991 Sep. 52(3):688-95. [Medline]. Rudolph AM. Congenital Diseases of the Heart. Chicago: Year Book Medical; 1974. Rao PS. Fetal and Neonatal Circulation. Kambam J (ed.). Cardiac Anesthesia for Infants and Children. St. Louis, MO: Mosby-Year Book; 1994. Chapter 2; pp. 10-19. Sihha SN, Rusnak SL, Sommers HM, et al. Hypoplastic left ventricle syndrome:analysis of 30 autopsy cases in infants with surgical considerations. Am J Cardio. 1968. 21:166. Nora JJ. Multifactorial inheritance hypothesis for etiology of congenital heart disease: the genetic-environmental interaction. Circulation. 1968. 38:604-17. Weinberg PM, Chin AJ, Murphy JD, Pigott JD, Norwood WI. Postmortem echocardiography and tomographic anatomy of hypoplastic left heart syndrome after palliative surgery. Am J Cardiol. 1986 Dec 1. 58(13):1228-32. [Medline]. Hinton RB, Martin LJ, Rame-Gowda S, Tabangin ME, Cripe LH, Benson DW. Hypoplastic left heart syndrome links to chromosomes 10q and 6q and is genetically related to bicuspid aortic valve. J Am Coll Cardiol. 2009 Mar 24. 53(12):1065-71. [Medline]. [Full Text]. Grossfeld P, Ye M, Harvey R. Hypoplastic left heart syndrome: new genetic insights. J Am Coll Cardiol. 2009 Mar 24. 53(12):1072-4. [Medline]. Fyler DC. Report of the New England Regional Infant Cardiac Program. Pediatrics. 1980 Feb. 65(2 Pt 2):375-461. Freedom RM. Aortic atresia. Keith JD, Rowe RD, Vlad P, eds. Heart Disease in Infants and Children. 3rd ed. New York: McMillian; 1978. Fyler DC. Prevalence trends. Fyler DC, ed. Nadas' Pediatric Cardiology Hanley & Belfus. Philadelphia: 1992. Bove EL. Current status of staged reconstruction for hypoplastic left heart syndrome. Pediatr Cardiol. 1998 Jul-Aug. 19(4):308-15. [Medline]. Sinzobahamvya N, Photiadis J, Kumpikaite D, et al. Comprehensive Aristotle score: implications for the Norwood procedure. Ann Thorac Surg. 2006 May. 81(5):1794-800. [Medline]. Phelps HM, Mahle WT, Kim D, et al. Postoperative cerebral oxygenation in hypoplastic left heart syndrome after the Norwood procedure. Ann Thorac Surg. 2009 May. 87(5):1490-4. [Medline]. Cole CR, Eghtesady P. The myocardial and coronary histopathology and pathogenesis of hypoplastic left heart syndrome. Cardiol Young. 2016 Jan. 26 (1):19-29. [Medline]. Hornik CP, He X, Jacobs JP, et al. Complications after the Norwood operation: an analysis of The Society of Thoracic Surgeons Congenital Heart Surgery Database. Ann Thorac Surg. 2011 Nov. 92(5):1734-40. [Medline]. [Full Text]. Galindo A, Nieto O, Villagra S, Graneras A, Herraiz I, Mendoza A. Hypoplastic left heart syndrome diagnosed in fetal life: associated findings, pregnancy outcome and results of palliative surgery. Ultrasound Obstet Gynecol. 2009 May. 33(5):560-6. [Medline]. Kon AA. Ethics of cardiac transplantation in hypoplastic left heart syndrome. Pediatr Cardiol. 2009 Aug. 30(6):725-8. [Medline]. [Full Text]. Glauser TA, Rorke LB, Weinberg PM, Clancy RR. Congenital brain anomalies associated with the hypoplastic left heart syndrome. Pediatrics. 1990 Jun. 85(6):984-90. [Medline]. Rashkind WJ, Miller WW. Creation of an atrial septal defect without thoracotomy. A palliative approach to complete transposition of the great arteries. JAMA. 1966 Jun 13. 196(11):991-2. [Medline]. Rao PS. Role of Interventional Cardiology In Neonates: Part I. Non-Surgical Atrial Septostomy. Congenital Cardiol Today. 2007. 5(12):1-12. Rao PS. Static balloon dilatation of the atrial septum. Am Heart J. 1993 Jun. 125(6):1824-7. [Medline]. Park SC, Neches WH, Zuberbuhler JR, et al. Clinical use of blade atrial septostomy. Circulation. 1978 Oct. 58(4):600-6. [Medline]. Rao PS. Transcatheter blade atrial septostomy. Cathet Cardiovasc Diagn. 1984. 10(4):335-42. [Medline]. Atz AM, Feinstein JA, Jonas RA, Perry SB, Wessel DL. Preoperative management of pulmonary venous hypertension in hypoplastic left heart syndrome with restrictive atrial septal defect. Am J Cardiol. 1999 Apr 15. 83(8):1224-8. [Medline]. Rao PS, Levy JM, Chopra PS. Balloon angioplasty of stenosed Blalock-Taussig anastomosis: role of balloon-on-a-wire in dilating occluded shunts. Am Heart J. 1990 Nov. 120(5):1173-8. [Medline]. Siblini G, Rao PS. Coil Embolization in the Management of Cardiac Problems in Children. J Invasive Cardiol. 1996 Sep. 8(7):332-340. [Medline]. Rao PS. Transcatheter Embolization of Unwanted Blood Vessels in Children. Rao PS, Kern MJ. (editors). Catheter Based Devices for Treatment of Noncoronary Cardiovascular Disease in Adults and Children. Philadelphia, PA: Lippincott, Williams & Wilkins; 2003. Rao PS. Protein-Losing Enteropathy following the Fontan Operation (Editorial). J Invasive Cardiol. 2007. 19:447-448. Rao PS, Chandar JS, Sideris EB. Role of inverted buttoned device in transcatheter occlusion of atrial septal defects or patent foramen ovale with right-to-left shunting associated with previously operated complex congenital cardiac anomalies. Am J Cardiol. 1997 Oct 1. 80(7):914-21. [Medline]. Rao PS. Transcatheter Closure of Atrial septal Defects with Right-to-left Shunt,. Rao PS, Kern MJ, eds. Catheter Based Devices for Treatment of Noncoronary Cardiovascular Disease in Adults and Children. Philadelphia, PA: Lippincott, Williams & Wilkins; 2003. Peterson AL, Quartermain MD, Ades A, Khalek N, Johnson MP, Rychik J. Impact of mode of delivery on markers of perinatal hemodynamics in infants with hypoplastic left heart syndrome. J Pediatr. 2011 Jul. 159(1):64-9. [Medline]. Baba K, Ohtsuki S, Kamada M, et al. Preoperative management for tricuspid regurgitation in hypoplastic left heart syndrome. Pediatr Int. 2009 Jun. 51(3):399-404. [Medline]. Day RW, Barton AJ, Pysher TJ, Shaddy RE. Pulmonary vascular resistance of children treated with nitrogen during early infancy. Ann Thorac Surg. 1998 May. 65(5):1400-4. [Medline]. Caylor GC, Smeloff EA, Miller GE. Surgical palliation of hypoplastic left side of the heart. New Engl J Med. 1970. 282:780. Doty DB, Knott HW. Hypoplastic left heart syndrome. Experience with an operation to establish functionally normal circulation. J Thorac Cardiovasc Surg. 1977 Oct. 74(4):624-30. [Medline]. Fontan F, Baudet E. Surgical repair of tricuspid atresia. Thorax. 1971 May. 26(3):240-8. [Medline]. Kreutzer G, Bono H, Galindez E:. Una operacion para la correccion de la atresia tricuspidea. Oct. 31-Nov. 6. Buenos Aires, Argentina. Ninth Argentine Congress of Cardiology. 1971.
de Leval MR, Kilner P, Gewillig M, Bull C. Total cavopulmonary connection: a logical alternative to atriopulmonary connection for complex Fontan operations. Experimental studies and early clinical experience. J Thorac Cardiovasc Surg. 1988 Nov. 96(5):682-95. [Medline]. Sano S, Ishino K, Kado H, et al. Outcome of right ventricle-to-pulmonary artery shunt in first-stage palliation of hypoplastic left heart syndrome: a multi-institutional study. Ann Thorac Surg. 2004 Dec. 78(6):1951-7; discussion 1957-8. [Medline]. Pizarro C, Malec E, Maher KO, Januszewska K, Gidding SS, Murdison KA. Right ventricle to pulmonary artery conduit improves outcome after stage I Norwood for hypoplastic left heart syndrome. Circulation. 2003 Sep 9. 108 Suppl 1:II155-60. [Medline]. Ghanayem NS, Jaquiss RDB, Cava JR, et al. Early postoperative hemodynamic comparison of the right ventricle to pulmonary artery conduit and the innominate artery to pulmonary artery shunt for hypoplastic left heart syndrome: Results of a single institution randomized prospective study. Ann Thorac Surg. 2006. 82:1603–1609. Ohye RG, Sleeper LA, Mahony L, Newburger JW, Pearson GD, Lu M. Comparison of shunt types in the Norwood procedure for single-ventricle lesions. N Engl J Med. 2010 May 27. 362(21):1980-92. [Medline]. Siehr SL, Maeda K, Connolly AA, et al. Mitral stenosis and aortic atresia-a risk factor for mortality after the modified Norwood operation in hypoplastic left heart syndrome. Ann Thorac Surg. 2016 Jan. 101 (1):162-7. [Medline]. Choussat A, Fontan F, Besse P. Selection criteria for Fontan procedure. Shinebourne EA, Anderson RH, eds. Pediatric Cardiology. Harcourt Health Sciences Group; 1977. 1978:559. Laks H, Pearl JM, Haas GS, et al. Partial Fontan: advantages of an adjustable interatrial communication. Ann Thorac Surg. 1991 Nov. 52(5):1084-94; discussion 1094-5. [Medline]. Bridges ND, Lock JE, Castaneda AR. Baffle fenestration with subsequent transcatheter closure. Modification of the Fontan operation for patients at increased risk. Circulation. 1990 Nov. 82(5):1681-9. [Medline]. Thompson LD, Petrossian E, McElhinney DB, et al. Is it necessary to routinely fenestrate an extracardiac fontan?. J Am Coll Cardiol. 1999 Aug. 34(2):539-44. [Medline]. Monagle P, Cochrane A, Roberts R, et al. Fontan Anticoagulation Study Group. A multicenter, randomized trial comparing heparin/warfarin and acetylsalicylic acid as primary thromboprophylaxis for 2 years after the Fontan procedure in children. J Am Coll Cardiol. 2011. 58:645-651. doi: 10.1016/j.jacc.2011.01.061. Konertz W, Schneider M, Herwig V, Kampmann C, Waldenberger F, Hausdorf G. Modified hemi-Fontan operation and subsequent nonsurgical Fontan completion. J Thorac Cardiovasc Surg. 1995 Sep. 110(3):865-7. [Medline]. Hausdorf G, Schneider M, Konertz W. Surgical preconditioning and completion of total cavopulmonary connection by interventional cardiac catheterisation: a new concept. Heart. 1996 Apr. 75(4):403-9. [Medline]. [Full Text]. Sidiropoulos A, Ritter J, Schneider M, Konertz W. Fontan modification for subsequent non-surgical Fontan completion. Eur J Cardiothorac Surg. 1998 May. 13(5):509-12; discussion 512-3. [Medline]. Galantowicz M, Cheatham JP. Lessons learned from the development of a new hybrid strategy for the management of hypoplastic left heart syndrome. Pediatr Cardiol. 2005 May-Jun. 26(3):190-9. [Medline]. Bacha EA, Daves S, Hardin J, et al. Single-ventricle palliation for high-risk neonates: the emergence of an alternative hybrid stage I strategy. J Thorac Cardiovasc Surg. Jan 2006. 131(1):163-171.e2. Epub 2005 Dec 5. Tworetzky W, Wilkins-Haug L, Jennings RW, van der Velde ME, Marshall AC, Marx GR. Balloon dilation of severe aortic stenosis in the fetus: potential for prevention of hypoplastic left heart syndrome: candidate selection, technique, and results of successful intervention. Circulation. 2004 Oct 12. 110(15):2125-31. [Medline]. Marshall AC, Levine J, Morash D, Silva V, Lock JE, Benson CB. Results of in utero atrial septoplasty in fetuses with hypoplastic left heart syndrome. Prenat Diagn. 2008 Nov. 28(11):1023-8. [Medline]. Braudis NJ, Curley MA, Beaupre K, et al. Enteral feeding algorithm for infants with hypoplastic left heart syndrome poststage I palliation. Pediatr Crit Care Med. 2009 Jul. 10(4):460-6. [Medline]. Tweddell JS, Hoffman GM, Mussatto KA, et al. Improved survival of patients undergoing palliation of hypoplastic left heart syndrome: Lessons learned from 115 consecutive patients. Circulation. 2002. 106:82–89. Hehir DA, Cooper DS, Walters EM, Ghanayem NS. Feeding, growth, nutrition, and optimal interstage surveillance for infants with hypoplastic left heart syndrome. Cardiol Young. 2011 Dec. 21 Suppl 2:59-64. [Medline]. Hansen JH, Furck AK, Petko C, Buchholz-Berdau R, Voges I, Scheewe J. Use of surveillance criteria reduces interstage mortality after the Norwood operation for hypoplastic left heart syndrome. Eur J Cardiothorac Surg. 2012 May. 41(5):1013-8. [Medline]. Carlo WF, Carberry KE, Heinle JS, Morales DL, McKenzie ED, Fraser CD Jr. Interstage attrition between bidirectional Glenn and Fontan palliation in children with hypoplastic left heart syndrome. J Thorac Cardiovasc Surg. 2011 Sep. 142(3):511-6. [Medline]. Elzenga NJ, Gittenberger-de Groot AC, Oppenheimer-Dekker A. Coarctation and other obstructive aortic arch anomalies: their relationship to the ductus arteriosus. Int J Cardiol. 1986 Dec. 13(3):289-308. [Medline]. Rao PS. Perinatal circulatory physiology. Indian J Pediatr. 1991 Jul-Aug. 58(4):441-51. [Medline]. Disclosure: Received honoraria from St. Jude/AGA Medical for speaking and teaching; Received honoraria from WL Gore Company for speaking and teaching.